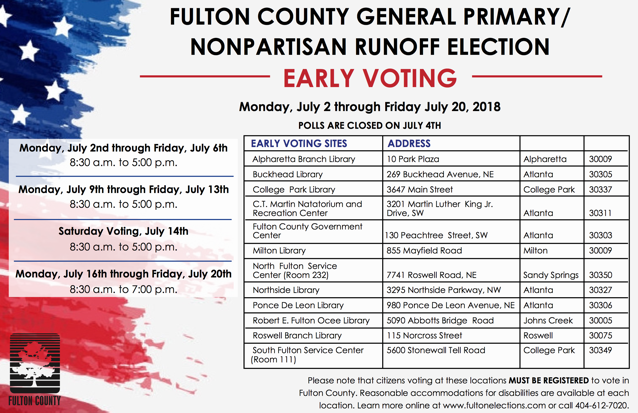 Fulton County has 12 Early Voting locations for the 2018 General Primary/Nonpartisan and Special Election Runoff. Polls are open Monday through Friday until July 20, 2018. Polls will also be will open Saturday, July 14, 2018, from 8:30 a.m. – 5:00 p.m. During the final week of early voting, Monday, July 16 – Friday July 20, polls will be open from 8:30 a.m. – 7:00 p.m.
Monday, July 16 – Friday July 20 from 8:30 a.m. – 7:00 p.m.